The Wikipedia page on Edward Snowden contains a measure of general biographical information about the fellow who leaked NSA intelligence to the media. Born in Elizabeth City, North Carolina on June 21, 1983, Mr. Snowden, age 29, is being sought with all the force of America's global tracking abilities with help from other entities, it may be assumed. Some US congress members are focused on his alleged 'treason' though they don't care to discuss how the US Congress, the Executive Branch, and the Justice System have eroded the Fourth Amendment to the US Constitution with their overreaching surveillance tactics and data mining of all personal communications. 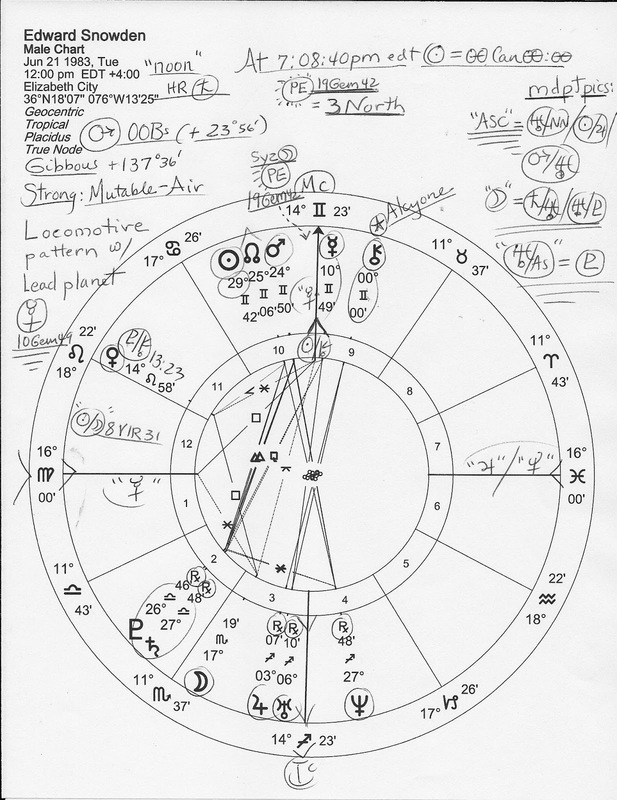 When the news of the NSA leaks began, astrologers instantly thought of Mr. Snowden's Saturn Return (see dates, below) when they heard his age of 29 years for this marks the cycle of Saturn around the Sun. Taking responsibility and accepting one's accountability are lessons to be learned from the Old Task Master, Saturn. And of course, Snowden's 30th birthday occurs on Friday, June 21st along with Summer Solstice 2013 when the Sun reaches 00Cancer00:00, a Cardinal World Point of Prominence, Fame, and Recognition. Well, Mr. Snowden has definitely achieved an abundance of recognition this year. As you see, Snowden was born with a Geminian Mars out of bounds (a lone actor), plus, a Locomotive pattern (drive to success) with Mercury @10Gem49 as lead planet and his facility with technology and coding bears out these Mercurial placements. Even Mercury's traditional role as The Messenger applies. However, if born after 7:08:40 pm edt, the Sun was @00Can00 giving him a Water-Water blend of Sun Can-Moon Sco. 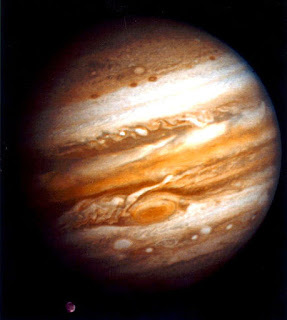 If born prior to 7:08 pm, he has Sun Gem-Moon Sco, an Air-Water blend of mistiness that can easily dissolve into tears. From his one interview, this doesn't seem to me to describe him--though 'leaker' applies to his current status so I'll include here a few details on both Sun-Moon combinations for your consideration. With Gemini the sign of Communications of all sorts (and of duplicity), there is much to be said for his having a Sun Gem-Moon Sco personality blend with the Moon in Scorpio (sign of spying, secrets, and betrayal) for the 24-hour period of his birth day so we can be certain his Moon (reigning need) is in Scorpio where controlling, restrictive authoritarian Saturn now treads. 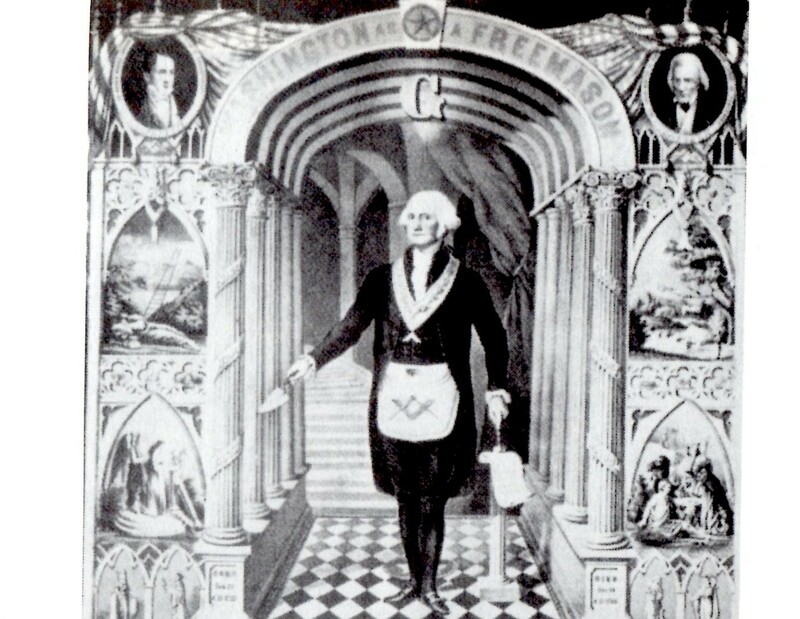 Plus, at a crisis 29th degree of Gemini, his Sun would strain toward 00Cancer and prominence while retaining the crisis emphasis he has set in motion through his own actions. My point is that a Saturn-to-natal-Moon transit is difficult and depressive for its sobering effects and burdensome conditions. There is often a forced change of residence (Hong Kong, then on to...jail?) along with emotional deprivation, anxiety, and loss. Mothers and other females in his life may suffer (and I think they already have.) Illness from the stress is likely to follow and we know he has been diagnosed with epilepsy and used the condition as an excuse for his flight to Hong Kong with leaks trailing behind. 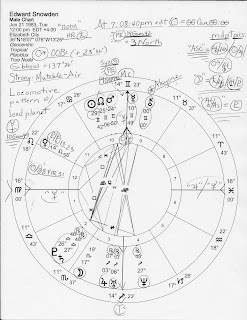 Plus, while Saturn (government, law, and business) remained in the final degrees of Libra where it is exalted, Snowden had a three-fer Saturn Return: 1. December 24, 2011; 2. March 24, 2012; 3. September 16, 2012. Libra is the sign of balance and Snowden seems to want balance restored to a fairer level between the people and the governing class, and there are many hard lessons to digest with a triple Saturn Return which will color his life for approximately the next 29 years. Now Sun Gem-Moon Sco provides a picture of one who is both an extrovert and an introvert, and is provocative and paradoxical. This combo has a gift for selling (a Geminian trait of commerce and trade) and is happiest when there are challenges and intrigues involved within work situations. Restlessness and cynicism may be evident, along with changeableness and inconsistency. Sun Gem-Moon Sco is the natal blend of novelist G. K. Chesterton so let's hear a few words from him: "The Bible tells us to love our neighbors, and also to love our enemies; probably because they are generally the same people." This blend denotes one who is perceptive, intensely emotional, and self-protective (good luck to him on that score!) and is deeply fascinated with what makes people tick. Genuine concern for the world is in evidence, and a preoccupation with hidden things is described. A lover of mystery and suspense, Sun Can-Moon Sco personalities believe in respecting the privacy of others (unless other chart factors interfere), and there is a subjective brooding quality to its suspicious nature. Analytical powers are a talent, and when given a search warrant to look inside a bank account or other information, these powers become concentrated into a determination to discover the truth to the point of fanaticism. Living on the edge is attractive with this blend, and emotional courage emerges in times of crisis and duress--such courage he needs now and going forward so if this is his natal Sun-Moon blend, he possesses it. Sun Can-Moon Sco is shared by neuro-psychologist, actor, and writer Jonathan Miller and the following quote from him seems very closely to apply to the stated views of Edward Snowden: "The human body is private property." But apparently our personal communications are not. Yet the hour grows late so I'll close with Edward Snowden's Pre-Natal Eclipse Saros Series, the 3 North, which is the PE Series of the CIA (1947) and of the attacks of 9/11/01. 3N themes are 'worries and obsessions, news involving young people, or news that transforms a situation. A caution is to not get carried away with large plans or activities.' (Brady.) Next occurrence: July 2, 2019 @11Cancer. Great advice, but it's too late on all counts especially since 9/11/01 has been used to justify the USA Patriot Act which allegedly codifies our nation's march toward a Surveillance State which some call Big Brother. Wonder if the mainstream media and politicians will now stop bashing 'fringe' broadcasters like Alex Jones and admit that he and others were right about the police state 'spyocracy' all along? White House Petition to Pardon Edward Snowden. 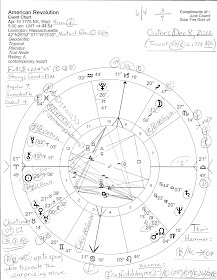 Most Sun-Moon blend info from Sun Sign-Moon Sign by Charles & Suzi Harvey, some from my personal notes.